Scratching the itch – HubNut – celebrating the average! I wrote back in October about how I very much desired a Land Rover Discovery. That itch just hasn’t gone away, which is hardly surprising. As that previous Blog tells you, I’ve had a strong emotional link to the vehicles since I was 15 as the very first car I drove was a Discovery. Reality caused me to spend many years driving 2CVs instead. They were cheap back in the mid-1990s and HUGE fun. That led to a new obsession that hasn’t ended even today. I love 2CVs and can’t really see me being without one. Land Rover desires were put on hold. Then we moved to Wales. 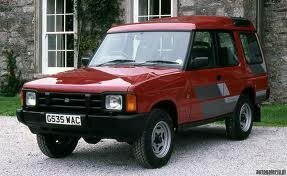 Not long after, I purchased a Land Rover 90 V8. This was a silly thing to do, but it was cheap! Running it was not though – 15mpg was as good as it got. I sold it, then spent the profit (almost £700) and a bit more on a Reliant Scimitar. This was also a silly thing to do, but it was another dream car to cross off the list. Then I bought a Range Rover. That was fun, though I spent a LOT of time trying to fix its many foibles before giving up. It was awesome off-road, pretty good on it but it wasn’t a Discovery. The split tailgate was annoying and the horrific interior just depressing. Luxury vehicle my arse! Fisher Price has a much better command of plastics. I tried satisfying my off-road desires with a Ford Maverick instead. It was far better off-road than I expected – and confounded quite a few people. It was pretty awful on the road though. The ride was too firm and than translated on rocky tracks when green laning too. It was bloody uncomfortable compared to the Rangie. All of this was a denial of the one I must surely seek out. A Discovery. Who cares that the underpinnings were already 19 years old when it was launched back in 1989. Those underpinnings have massive ability. Who cares about the claimed reliability woes either. Scouring the classifieds has taught me that a great many Discovery 1s have sailed past 150,000 miles, or even 200,000 miles. Sure, bits need replacing from time to time, but they are at least generally not eye-watering. Should I wish to go down that route, there are many accessories to boost off-road performance. I’m not sure I do want to do that – I get a bigger kick out of taking a bog standard vehicle to its limits. I’m frantically searching for one now. Despite the fact that my school work experience was spent working on 95Model Year facelift Discos, it has to be a pre-facelift one for me. I love the ‘looks like a Mk2 Transit’ nose and the Terence Conran interior. Later models tried to be more fancy than they really were, and I don’t think it worked too well. Now really is the time to act. Pre-facelift Discos are becoming rather rare. They must surely start attracting some collector interest at some point – I hope so. It was only the third new passenger car design in Land Rover’s then 41-year history and arguably became its most important model. Naturally, I could really do with selling the Merc. If anyone wants a Mercedes-Benz 300E W124, it’s very much for sale with an asking price of £545. Offers will be considered!